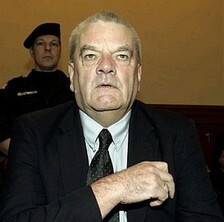 Holocaust denier David Irving awaiting Vienna court's verdict on his appeal. Demonstrators broke into Oxford's venerable debating society Monday night, sitting on the debating table of the Oxford Union to protest the appearance of infamous Holocaust denier David Irving and far-right British National Party leader Nick Griffin. At least 200 protesters chanted anti-fascist slogans and waved placards decrying the appearance of the two. Irving and Griffin were bundled into the hall hours before the forum was to take place as protesters yelled "Keep Oxford fascist-free; We will defend democracy." Just minutes before the debate was due to take place, a group of protesters broke through the security cordon around the Union and staged a sit-down protest in the hall. Several students groups, including the Oxford Student Union and the university's Jewish and Muslim societies, have teamed up with activist group Unite Against Fascism to organize the protest. 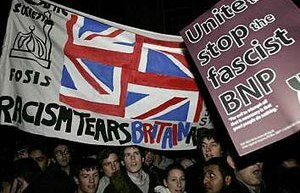 The Union of Jewish Students (UJS) organized buses of Jewish students from Birmingham, Bristol, Cambridge and many London campuses to join representatives from Jewish Council for Racial Equality, the National Union of Students and Unite Against Fascism. Yair Zivan, UJS campaigns organizer, said he was "appalled" by the invitation. "We are desperately disappointed that the president of the union has chosen to allow this debate to go ahead," Zivan said. "The [union] president seems completely unconcerned by the offense this debate has caused to Jewish students." The Union, while independent of Oxford University, is composed mainly of university students. Union members voted Friday to allow the men to speak, despite calls to have the invitations revoked. The union's president, Luke Tryl, has said he invited the men to talk about the limits of free speech, not to expound on their views. "The reason the Oxford Union was founded 184 years ago was to promote and defend freedom of speech. This is what this debate is about," he told Sky News on Sunday. "It is about an opportunity to challenge David Irving and Nick Griffin." "Democracy does include the right to free speech - so long as that doesn't incite hatred against others - but it also includes the right to tell extremists that they're not welcome and the responsibility to protect minorities," Zivan said. "By allowing this event to go ahead, the president has put the welfare of Jewish students on campus secondary to his own publicity seeking and we believe that this will send out entirely the wrong message," he added. Irving was arrested in November 2005 in Austria on charges stemming from two speeches he gave in 1989 in which he was accused of denying that the Nazis exterminated 6 million Jews. Denying the Holocaust is a crime in Austria, which was occupied by the Nazis. Irving was convicted in February 2006 and sentenced to three years in prison. He served 13 months and was released on probation. He arrived for Monday's forum carrying a ball and chain. Irving has refused to use the term Holocaust, calling it a concept that "became cleverly marketed." "The Holocaust was one of the greatest crimes of the 20th century and its apologists are today resurfacing in academic spheres," said Dr. Edie Friedman, director of the Jewish Council for Racial Equality. "When the Nazis were defeated, the world said 'Never Again.' That means never again would we, who truly value democracy, allow it to be used to promote fascism. If we truly value democracy we must not give platforms to those who seek to destroy it." The Board of Deputies of British Jews, the representative body of Anglo Jewry, issued a statement on Monday condemning the event as an "immature student stunt." "Generations of students have sought to push at boundaries, often doing so with a mixture of idealism and naivety," Jon Benjamin, chief executive of the Board of Deputies said. "Those who issued these invitations doubtless think that they too are testing the limits of free speech, but rather than being daring and original, they are just being dupes. Most of the rest of us see this as a rather immature student stunt which in this case has wider ramifications because of the credibility Irving and Griffin will seek to claim from their involvement." Griffin runs a party that campaigns on a fiercely anti-immigration and anti-Muslim platform. A Unite Against Fascism spokesman said: "The Oxford Union should not be providing a platform for fascist British National Party leader Nick Griffin and Holocaust denier David Irving in the Free Speech Forum. There is a world of difference between defending free speech and choosing to provide a platform for fascists. "Far from being the champions of free speech, history shows that when fascists rise to power they destroy freedom of speech, democracy, human rights and they have murdered millions of people and attempted to annihilate entire communities. Wherever fascists have a presence, violence and intimidation increases. The Oxford University Student Union and the National Union of Students also protested the event. "First and foremost, Oxford University Students Union has been concerned about the safety of students and local residents of Oxford," Martin McCluskey, Oxford University Students Union president said. "From the outset, we have made it clear we support freedom of speech and any genuine debate on it. Where the BNP and Holocaust deniers go, violence follows." "The Holocaust denier, David Irving and leader of the fascist BNP, Nick Griffin have no place in our multicultural society let alone on our diverse university campuses," National Union of Students president Gemma Tumelty said. "NUS utterly opposes racism and fascism wherever it arises and will certainly oppose any attempt by Oxford University's Debating Society to invite Irving and Griffin to speak." Tumelty continued: "The pair's racist, anti-Semitic, homophobic and Islamophobic views threaten the safety of our diverse university communities. Wherever the BNP is active, racist attacks and other hate crimes increase. "With freedom of speech comes the responsibility not to abuse it. All students have a right to learn in an environment free from discrimination or harassment. It is unacceptable to expose students and staff at any university to the possibility of attacks and to give a platform of academic respectability to Griffin and Irving." Hundreds of protesters disrupted a debate on free speech at Oxford University on Monday, throwing eggs and staging a sit-in to try to prevent convicted Holocaust denier David Irving from speaking. British riot police ringed the approach to the 184-year-old Oxford Union building in an effort to keep the protests by about 500 anti-fascist demonstrators, including Jewish and Muslim students, as peaceful as possible. The debate was delayed by an hour-and-a-half but eventually went ahead in altered form with Irving, a British historian convicted and jailed by an Austrian court in 2006 for glorifying Nazism, taking part despite howls of protest. Irving was due to be joined by Nick Griffin, leader of the far-right British National Party, in the debate with four other speakers, including two students, in the same hall. But when the protesters broke into the hall and disrupted proceedings, the event became a fractured discussion, with Irving in one room with two other speakers and Griffin in another room with the remaining two. The demonstrators had gathered outside the prestigious debating society, where former U.S. President Bill Clinton and Mother Theresa have spoken, several hours before the debate. Irving and Griffin were spirited into the hall before the demonstrations began. Afterwards, students who took part in the debate said they were glad it had gone ahead despite the disruptions. "I think it was a very balanced argument and both sides did really well," undergraduate Roland Scarlett told the BBC. Protesters said they were pleased to have made their point. Commentators had lined up to condemn the union for staging the debate, saying the student-led organization was giving a platform to extremism partly in an effort to attract attention. The union had previously invited Kermit the Frog to speak. Enraged at Irving's invitation, several prominent people, including British Defense Secretary Des Browne, canceled engagements for future debates. A politician from the opposition Conservative Party resigned from life membership of the union. Irving, 69, has written several books which defend Adolf Hitler and deny the systematic extermination of six million Jews by the Nazis. He has been branded anti-Semitic and a racist by a British judge. Griffin's British National Party is on the fringe of British politics, earning a reputation for strident positions against Muslims and immigration, although he has denied racism. Oxford Union President Luke Tryl had defended the decision to invite the two saying the best way to counter extremism was to defeat it intellectually in debate. "These people are not being given a platform to extol their views but are coming to talk about the limits of free speech," he wrote in a letter to union members who had expressed concern. "It is my belief that pushing the views of these people underground achieves nothing ... Stopping them speaking only allows them to become free speech martyrs," he added. Ned Temko, chief political correspondent of the Observer newspaper and a former editor of the Jewish Chronicle, said it was disingenuous of the debating society to invite the two and then try to hide behind the banner of freedom of speech. "It's not a question about giving them a platform, it's about giving them credibility," he told the BBC. "It's ridiculous and it's irresponsible."